Please note: Coupon codes allow users to view content for 30 days, and can be reused until December 31, 2013. Drawing on more than 40 interviews with Steve Jobs himself, critically acclaimed and bestselling biographer Walter Isaacson presents a remarkable new account of Jobs. 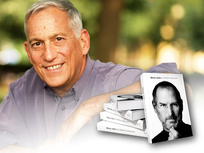 After two years of research, speaking with family members, friends, competitors and colleagues, Isaacson has compiled the story and life of one of the most influential people of the modern era. Apple cofounder Steve Jobs was a visionary and an inspiration to both tech geeks and luddites worldwide. 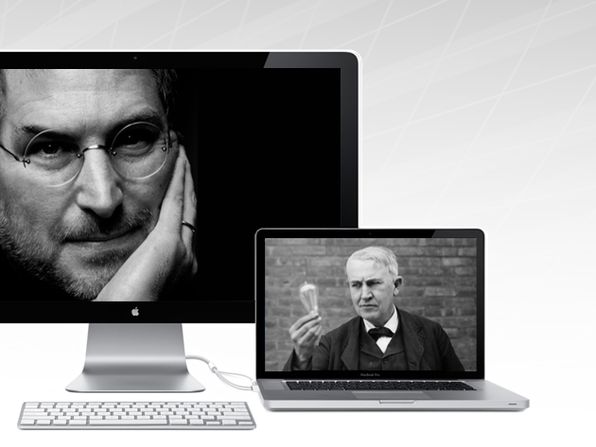 His products fused technology and design in unprecedented ways. But much of the fiercely private businessman’s life was obfuscated by rumor and legend, and a full picture of the man and his astounding legacy has not emerged." Walter Isaacson is the president and CEO of the Aspen Institute, a nonpartisan educational and policy studies institute based in Washington, DC. He has been the chairman and CEO of CNN and the editor of TIME magazine. He is the author of Steve Jobs (2011), Einstein: His Life and Universe (2007), Benjamin Franklin: An American Life (2003), and Kissinger: A Biography (1992), and coauthor of The Wise Men: Six Friends and the World They Made (1986). 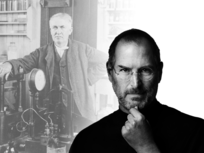 In a discussion led by Sarah Miller Caldicott, great-grandniece of Thomas Edison, she compares Steve Jobs to Edison: "If Edison showed us how to develop revolutionary technologies, Jobs showed us how to interact and connect with technologies in new ways." Caldicott holds this forum as a speaker at The World Technology Summit & Awards, where the conference theme was "SURVIVE 2012, PREPARE FOR 2021." Speakers ranged from Ray "Singularity" Kurzweil to Dan "Back of the Napkin" Roam to Susan "President of the ACLU" Herman to discuss the toughest issues of today so we can figure out how to navigate to tomorrow. A great grandniece of Thomas Edison, Sarah Miller Caldicott has been engaged in creativity and innovation throughout her life. Inspired by a family lineage of inventors dating back five generations, Sarah began her 25-year career as a Marketing executive with major brand-driven firms, including Quaker Oats and the Helene Curtis subsidiary of Unilever. She then co-authored the first book ever written on the subject of Edison's world-changing innovation methods, entitled Innovate Like Edison. Innovate Like Edison has been translated into 5 languages, and is used as a textbook in graduate and undergraduate programs across the US. What Does History Teach Us About Fostering Innovation? Author Sir Harold Evans and professor William J. Baumol discuss the key ingredients to technological innovation by highlighting the successful careers of Thomas Edison and Steve Jobs. According to Evans, "Innovation is actually very, very much more than technology, or discovery, or science." The Ideas Economy is an online forum that convenes experts from around the world on the subjects of innovation, intelligent infrastructure, information, and human potential. It attracts a community of active participants from business, government, non-profits and the academy who are interested in collaborating to solve global challenges, develop new ideas, and contribute to human progress. William J. Baumol is academic director at the Berkley Center for Entrepreneurship and Innovation in the New York University Stern School of Business. Sir Harold Evans is the author of They Made America: From the Steam Engine to the Search Engine: Two Centuries of Innovators. 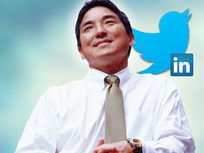 For nearly 30 years, Kawasaki has earned a notable reputation as a venture capitalist, entrepreneur and popular blogger. The former Apple evangelist shares his provocative insights and commonsense practices for succeeding in today's business world. Kawasaki's "no bull shiitake" approach is a reality check that covers everything from customer service to competition, innovation to marketing. Guy Kawasaki is a Silicon Valley venture capitalist. He was one of the Apple employees originally responsible for marketing the Macintosh in 1984. He is currently a Managing Director of Garage Technology Ventures, and has been involved in the rumor reporting site Truemors and the RSS aggregator Alltop. He is also a well-known blogger, who trades on his association with Apple. From the devastating aftermath of Hurricane Sandy to your Sunday eggs Benedict in the Mission, Instagram is documenting the world around us. Since its release in October 2010, this digital filter app is reported to have surpassed 100 million registered users, with peak uploads at over 200 photographs per second. The eye-catching communications platform has not left the limelight. Co-founders Mike Krieger and Kevin Systrom discuss the wild ride since Instagram's launch in 2010, to it's acquisition by Facebook in 2012, to the future of photo-sharing. Mike Krieger graduated from Stanford University where he studied Symbolic Systems with a focus in Human-Computer Interaction. He wrote his Master's thesis on how user interfaces can better support collaboration on a large scale. After graduating, he worked at Meebo for a year and a half as a user experience designer and as a front-end engineer before joining the Instagram team doing design & development. Kevin Systrom also graduated from Stanford University with a BS in Management Science & Engineering. After interning at Odeo, now Twitter, he spent two years at Google - the first of which was working on Gmail, Google Reader, and other products. Kevin has always had a passion for social products that enable people to communicate more easily, and combined with his passion for photography Instagram is a natural fit.